A photo of San Francisco at night with green power? Due to the unreliability of wind power and solar your electricity will still come from coal and gas power plants when those don’t work on windless and cloudy days. The startup costs $19.5 million including $15 million placed in an escrow account to pay Shell Energy North America if the program is terminated before the contract expires in 4½ years. San Francisco, touted as “the city that knows how” evidently only “knows how” to rip off the taxpayers. There are probably 19.5 million ways to spend that $19.5 million on things that would make San Francisco a better place to live than on overpriced faux green energy. The city’s a mess in many places. Traffic’s a mess, the streets are a mess, the homeless are a mess, crime is a mess, there are many blighted places. Let’s not forget that the schools are taking it in the shorts thanks to Jerry Brown’s faux budget that recently fell apart and could also use that money. Nope, in San Francisco politics it’s better to genuflect to the imaginary green energy god. Keeping PG & E who appears to be able to provide cleaner, more reliable and less expensive energy would have just been too simple compared to creating another SF bureaucracy that appears to be FUBAR before it even starts. If you thought that the power going out a Candlestick Park during a nationally televised football game was an embarrassment just wait and see what happens, or doesn’t, as the case may be. No wonder the 49’ers want to move to Santa Clara. It appears there’s at least one person in the Royal family with some common sense. Prince Phillip lets it fly and tells us what he really thinks! In comments that put him sharply at odds with the Government, the Prince reportedly said the farms were a ‘disgrace’ and they would never work. He also described people who backed them as believing in a ‘fairy tale’. Energy Secretary Chris Huhne last month denounced opponents of the plans as ‘curmudgeons and fault-finders’ and praised the turbines as ‘elegant and beautiful’. Chris Huhne. who’s obviously dumb and blind, must also think that Roseanne Barr should be parading around in a bikini at the next Miss America contest. Now if he’d only grab his son, Prince Charles, by his Dumbo-sized ears and rattle some sense into his head we might have something. Solar panels, touted by many to be a renewable energy panacea that will rid the planet of all those nasty coal-fired power plants, may be a bigger boondoggle than we already thought. We’ve already complained that they do not appear in many instances to provide a return in investment. It now appears that the time they provide energy before replacement is required is dramatically less than claimed. Thus shortening not only the life of the panels and the electricity generated, but also reducing the return on investment. If you listen to the mostly-Chinese manufacturers, solar panels work great. They can be expected to degrade about 0.5% a year. So that is how we build the economic models to finance, insure and subsidize the larger solar systems. In the real world, we are just starting to find out how bogus many of those predictions are. 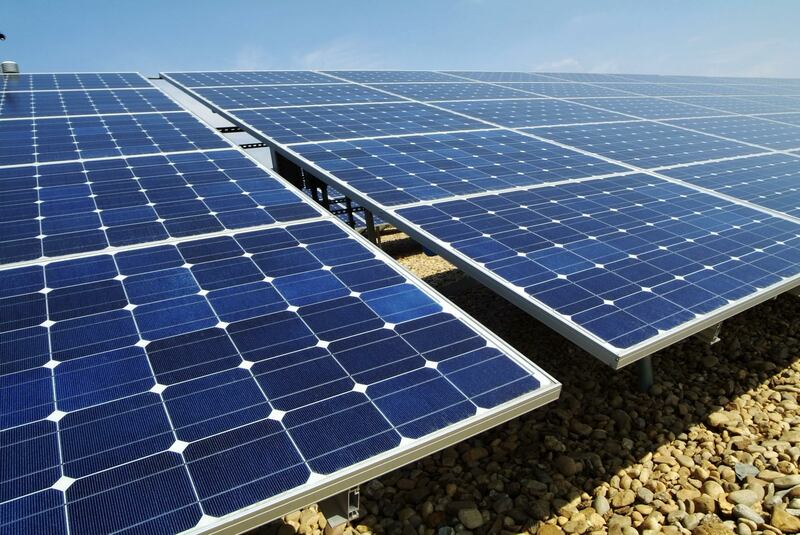 The National Renewable Energy Laboratory says that panels can degrade as much as 4.5% a year. Or more. Put that in your pro forma and see what your banker and insurance agent — or Congressman — say about that. While we see claims that average solar panels will last 25 to 30 years, the aforementioned claim of 0.5% per year means that solar panels should last an astounding 200 years (100% ÷ 0.5%). At the realistic rate of 4.5% per year they will only last about 22 years before replacement is needed (100% ÷ 4.5%), which is not even the 25 to 30 currently claimed by many and not even remotely close to 200 years. It gets worse folks. They don’t only degrade, it appears they also can literally fall apart and it doesn’t take very long. That is a lot of wasted money. 90% down the tubes after being used for only one year. No return on investment and very little ‘free’ electricity generated. All that is left is an eyesore that is a pile of toxic waste, wasted tax dollars and perhaps a tax deduction for a business loss. We are adverse to the lies about what renewable energy costs and what it’s capabilities are. We’re also adverse to the physical and financial messes left when solar and wind-power are abandoned. We’re extremely adverse to the rush to install solar and wind-power without having full knowledge about the effects. Look at the carnage left in the previous two links to see what we’re talking about. California seems to be leading the rush off the proverbial cliff via the implementation of AB32, California’s cap & trade law, that mandates power providers to generate 33% of their power from renewable (green) sources by a not too distant 2020. With many large solar projects planned in California, it would seem to be a logical move to slow down and find out what our money is being spent on and what the return on investment will be as opposed to rushing in head first, only to find another government mandated, costly boondoggle. To know what happens to government mandated boondoggles one only has to look at the Solyndra and Evergreen Solar fiascos. You can safely bet that when these solar energy plants fall apart at the seams, the taxpayers and energy consumers of California and other states will get stuck paying for the bill. It’s probably also a safe bet that the messes left at abandoned solar and wind farms will be there for decades as a reminder of what happens when the government gets involved in what should be private enterprise. Toronto Wind Action (TWA), The European Platform Against Windfarms (EPAW) and the North American Platform Against Windpower (NA-PAW) all trumpet a new scientific breakthrough vindicating windfarm victims worldwide. In a press release (July 25, 2011) TWA, EPAW and NA-PAW lament the loss of an Ontario court ruling but are spinning with joy at the news of an important scientific breakthrough that may help their quest to bring a halt to further growth in wind turbine siting and development. Ultra-green Denmark admits it has no idea what to with a worrisome mountain of old and broken wind turbine blades. The composite material can’t be recycled. Denmark has 6,000 wind turbines serving a population of 5.3 million and when the wind conditions are just right wind produces around 19 percent of its electricity. Yet despite huge financial investment no conventional power plant has yet been shut down while Danish electricity costs to consumers are the highest in Europe, according to research by energy researcher, Dr. Vic Mason. Turbine blades routinely exceed 60 meters in length and nearly all are manufactured from thermoset plastics that cannot be recycled once their useful life has expired. The special plastic is the only material currently known that meets reliability standards due to their relatively high strength and low weight properties. Dr. Mason cites evidence that many small turbines have collapsed in close proximity to human dwellings [1; 2; 3], and recently two big Danish wind turbines lost blades and scattered sharp pieces of glass fiber up to 500 meters from the tower base in high winds [4.]. Similar events have also been reported in Sweden, northern England and Scotland [5.]. Blade failure can be lethal and catastrophic as shown by video footage. Indeed, the death toll from wind turbines in recent decades is huge when compared with nuclear accidents. In 2008 in the U.S. alone there were 41 worker fatalities and 16 non-worker deaths. As the film shows, ironically, in high winds the turbines must be stopped because they are easily damaged. Carbon fiber has been the material of choice because of lightness and efficiency of construction. But the stress damage to fiber composites is poorly understood to begin with and wear and tear on blades can be considerable. Also, over time a build-up of dead bugs, plus other wear and tear reduces the power generated by 20 to 30 percent. So for safety and efficiency the blades must be regularly replaced. Currently the global market for wind turbine blade is growing at over 10 percent growth per annum and worth around US$2 billion a year. But shortsighted thinking has led to a situation where the greatest challenge now is to develop a profitable and safe recycling process for the unwanted carbon fiber blades. Since 2004, most European Union (EU) member states passed laws forbidding landfill disposal of carbon fiber composites. Further, incineration of plastics is discouraged because of the potential release of toxic byproducts. Professor Henning Albers from the Institut für Umwelt und Biotechnik, Hochschule Bremen, calculates that at current growth rates by 2034, there will be a mountain of 225,000 tonnes of unwanted rotor blade material waste. That’s a lot of landfill! The aircraft industry, a long-time user of composite plastics has, itself, had little success in solving the landfill problem. The aviation industry has tried to minimize landfill tipping by grinding down the thermoset composites into granules for use as filler materials (e.g., in asphalt). But there isn’t a commercial market for such waste. [1.] B.B., 2000: “Vindmølle lækkede olie. Kollapset vindmølle ved Rærup erstattes snart af ny”. “[Wind turbine leaked oil. Collapsed turbine near Rærup will soon be replaced by a new one]”. Nørresundby Avis, 09-02-2000. [2.] Bülow, T., 2001: “Exit Tjærborg”. Eltra magasinet, August 2001. [3.] Ritzau, 2005: “Vindmølle mistede sine vinger”. “[Wind turbine lost its blades]”. Jyllands-Posten, 21-01-2005. [4.] LiveLeak, 2008: “Windmill out of control” (Video of wind turbine exploding). Today Al Gore denounced global warming. In an apology speech he said………. Global warming is a fraud and I am ashamed of being conned into believing it! I have immediately cancelled my order for the new Fisker’s Karma electric car and I have ordered a new Hummer to replace it. The Hummer will have a twin-turbocharged 454 Chevy engine in is that bored out to 515 cubic inches, makes 950 HP and gets 1.2 miles per gallon. Since being green is no longer a problem with global warming and the drought in California is over I have ordered high-flush toilets for the 9 bathrooms in my new Mansion in Montecito, California. I have also added 3 more heaters and 3 more air conditioning units, the latter of which will be great for cooling me off when I have a hot masseuse over. Tomorrow I will start writing my new book about global cooling titled “An inconvenient deep freeze,” which will suggest that we start burning more stuff to create more CO2 so we can start warming this planet up before we all freeze to death! I am also suggesting to President Obama that we immediately start to drill baby drill all over the place. ANWAR? No problem! Deep drilling in the Gulf of Mexico! Go for it! Hell, I’m even going to make sure that off-shore drilling around Santa Barbara is approved again! I can’t wait for the view of all those drilling platforms! And………if you believe this….. I have a nice bridge that is golden in color that goes from San Francisco, California to Marin County, California and will be accepting bids starting at the minimum bid price of $100 billion. Have a happy April Fool’s Day! 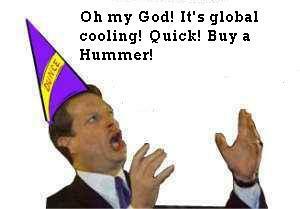 Comments Off on Gore denounces global warming!